fits line sizes 1" or 3/4"
Our Chafe Guard is the perfect solution all your chafing problems. 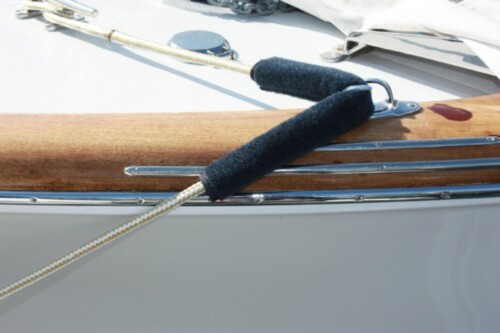 The Chafe Guard wraps around your dock line to protect the coat of your boat and stop the ever present squeaking noise. Held in place by Velcro fasteners the Chafe Guard is made with a soft yet durable, UV resistant polyester material that won't dry out or tear over time. With your choice of colors and sizes, the Chafe Guard to prolong the life of your dock line as well as the finish of your boat. Please allow 5-10 work days to manufacture. Custom sizes are not returnable and can not be cancelled once placed.